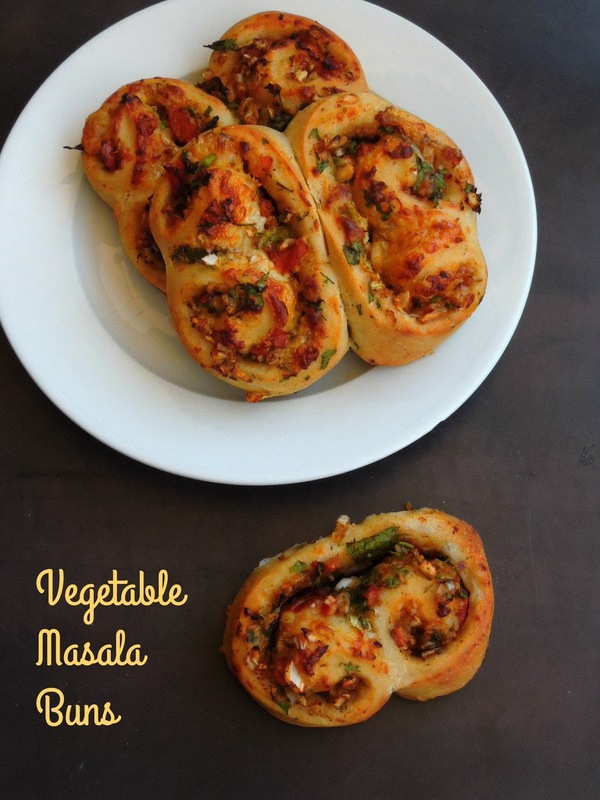 This month's bread of We Knead to Bake is this Vegetable Masala Bun, and this bread was suggested by Ankita. I have never baked masala buns with raw vegetables, but my today's vegetable masala buns calls for chopped onions, bellpepper, tomatoes and chopped coriander leaves. Initially i was bit skeptical to give a try somehow i have changed my mind and went with the chopped raw vegetables. 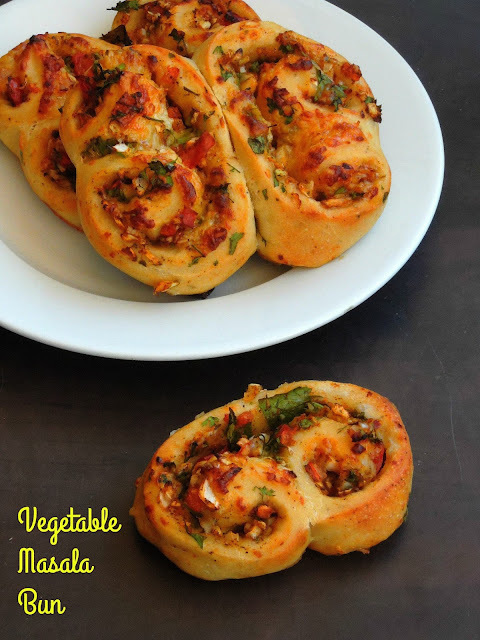 And this raw vegetables gets well cooked while baking and this buns smells simply fabulous. 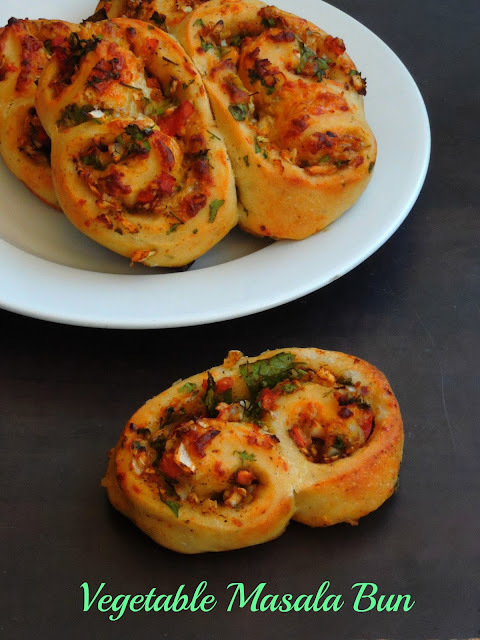 We just went on munching this vegetable masala buns as they were extremely addictive. Give a try if you want to make a simple bun to enjoy with your coffee. Take the flour, salt, sugar, instant yeast and olive oil in a bowl, gradually add luke warm water and knead everything for a while until the dough turns as a smooth dough. Arrange the dough in a greased bowl and keep in a warm place until the dough doubles the volume. Meanwhile take the chopped onions, chopped tomatoes, chopped green bellpepper, chopped green chilies, coriander leaves in a large bowl. Add the pepper powder and mix well, dont add the salt now else the vegetables will leave water. Punch down the dough and roll it as rectangle shaped disc. Now spread the pizza sauce and add the salt to the already prepared vegetable mix and sprinkle the vegetables on the top of the pizza sauce. Now top it with the grated cheese. Fold the dough on both sides to bring both edges to the middle to form a log. Meanwhile preheat the oven to 350F. Slice the dough as medium sized pieces and arrange over the baking sheet lined over a baking tray. Bake for 20-25 minutes until the crust turns golden brown.. Yes you can skip the cheese Maneesha Jain.